Kuzuzangpo la! 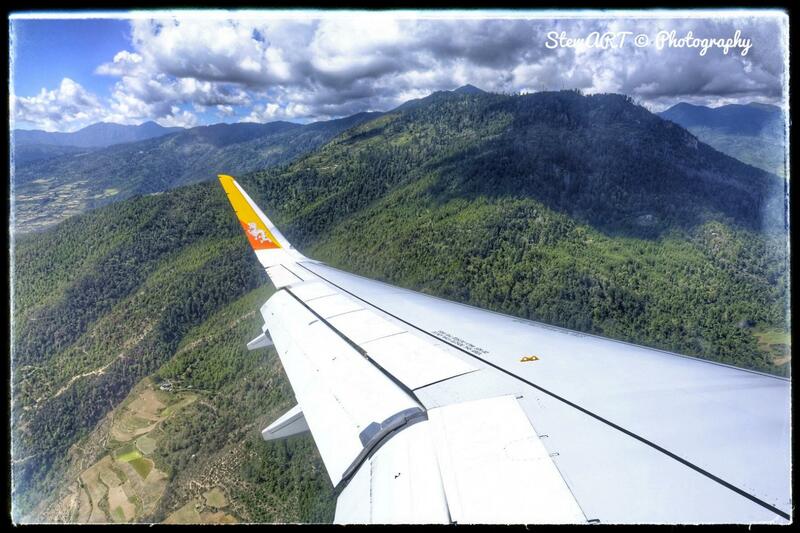 Your journey to the Kingdom of Bhutan is about to begin! Below you will find your journey at a glance for your reference. 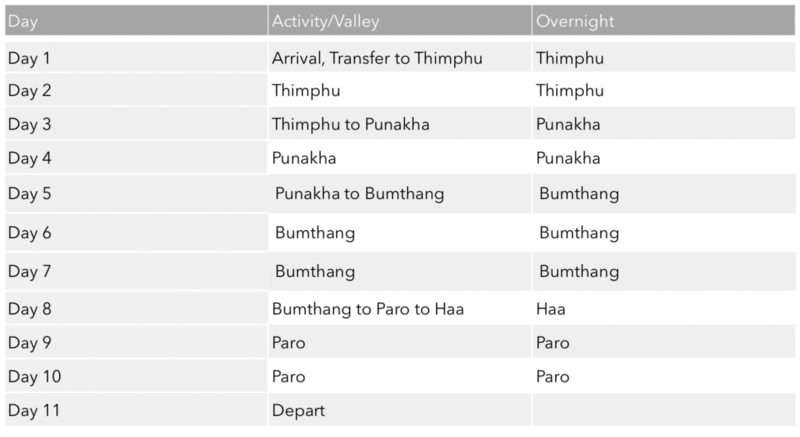 You’ll be provided with more details in our final itinerary upon confirmation, below is an outline of our itinerary during our 11 days nature, culture and landscape photography adventure in the mystical Bhutan! The Himalayan Kingdom of Bhutan sits tucked between Nepal, Myanmar and Bangladesh, and remains one of the most off-the-beaten-path destinations in the region. Besides trekking amid snow-capped peaks, visitors to Bhutan will find a host of lovely Buddhist monasteries and a schedule full of colorful cultural festivals. Arrive in Paro and proceed to Thimphu. The flight to Paro is one of the most spectacular mountain flights in the world with a constantly changing panorama of some of the highest mountains on earth. On the way we will visit Tamchhog Zam (Iron Bridge), the bridge is made of iron chain and the materials are from 15 century. We will start off early to visit the Buddha Point this morning. This massive statue of Shakyamuni measures in at a height of 51.5 meters [169 feet], making it one of the largest statues of Buddha in the world. Departing early to Punakha this morning, we will stop for a break at Dochula Pass, a mountain pass located approximately 3,140m above sea level. It’s a breath-taking viewpoint where you can capture a panoramic shot of Himalayan ranges that fall in Bhutan. There are also 108 Chortens (Stupas) built beautifully to mark the spot, We will spend sometime taking pictures and have our breakfast here. After breakfast, we will proceed with our 1.5 hours drive towards Punakha. 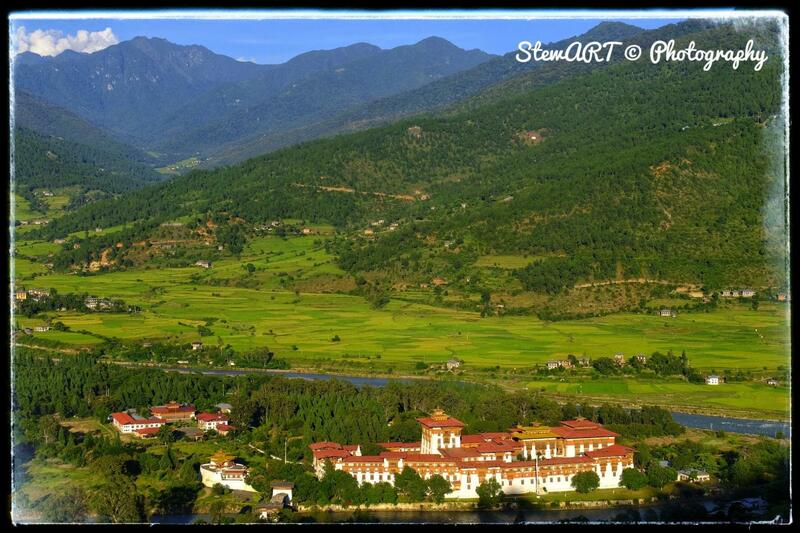 Today, we will proceed to visit ”The palace of great happiness or bliss", Punakha Dzong. Constructed by Ngawang Namgyal in 1637. 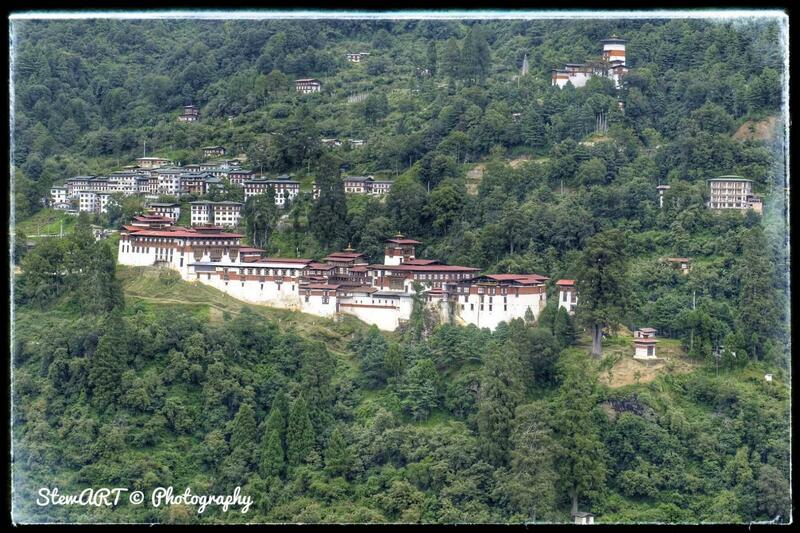 It is the second oldest and second largest dzong in Bhutan and one of its most majestic structures. Punakha Dzong was the administrative centre and the seat of the Government of Bhutan until 1955, when the capital was moved to Thimphu. Today we will take a 7 hours drive towards Bumthang through the winding road. We will drive through Trongsa and cross two passes, the 3300m Pelala pass, which separates western Bhutan from central Bhutan and Yotongla pass at 3400m. After breakfast, you will travel to the historical village of Ura in the Ura valley with packed picnic lunch. This intriguing village will delight you with its narrow cobble stoned streets and ancient houses. The people of this region are mostly yak and sheep herders and the women of the village still wear the traditional white headscarves and sheepskin shawls. 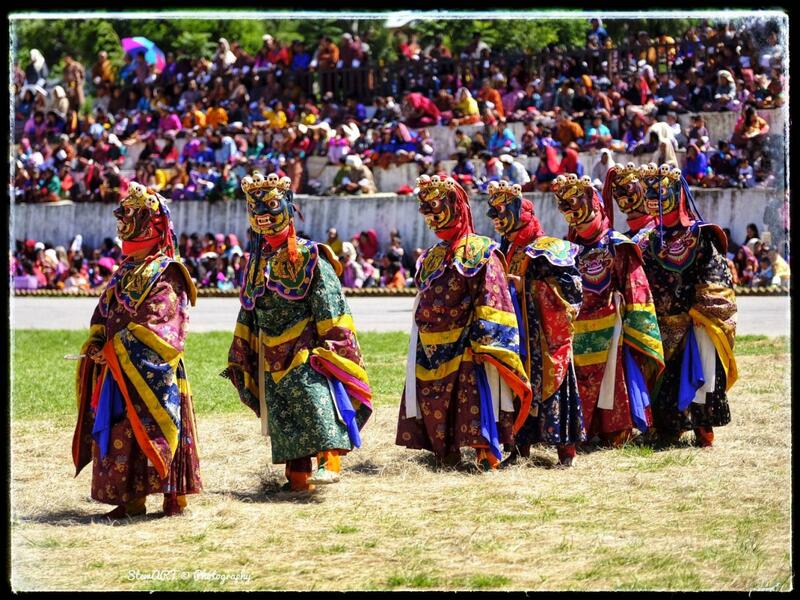 You will attend the last day of Ura Yakchoe and witness the local mask and folk dances performance. Departing early morning on a domestic flight back to Paro. Drive back the same way to Paro. 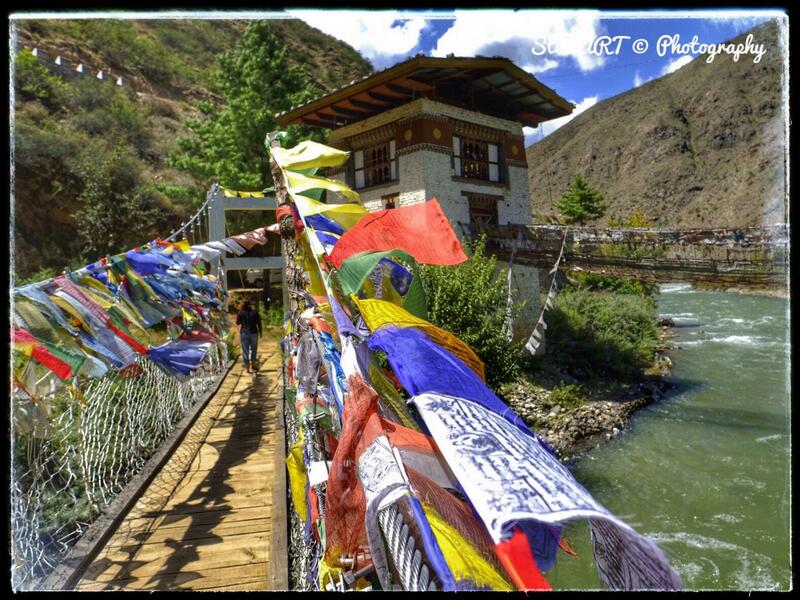 On the way, we will stop by and visit Kila Goenpa nunnery or Chele la Gompa. It is located on the cliffs below Chele pass at about 3,500m above sea level. Arrangements have been made for your transfer to the airport in time for your flight out. personal expenses such as laundry, telephone calls, tips & gratuity, soft & hard drinks, rafting and any other optional activities (if not specified in itinerary), porterage etc. ~ Special access inside selected monastery/nunnery for photography. ~ Visits to farmhouses and small villages.